I know I've mentioned (complained; yes, I know I've complained :) ) before about how the general population have a pre-conceived idea about what we (florists - at least myself as s florist; other's may well vary) do all day. This very morning (Monday evening as I start this - it could well be Friday evening before I finish it) someone has asked me "So, what exactly do you do all day?" to which I replied "as little as possible, obviously" smiling. It's a good question really, in the grand-scheme-of-things. What do I do all day? My day begins at 7am when I first check for any online orders which have been placed overnight; I do this just-in-case there are any which need to go out on the first delivery run (Chris (our driver) will organise his routes the day before, however, I know he always checks between 7.30 - 8 each morning for any extras which may need to be added to his routes). Of course, between me checking and arriving at the shop more can be (and often do) placed. I arrive at the shop around 7.30am (give-or-take a few minutes depending on traffic). The first thing I do upon arrival is move all the flowers the wholesalers have left that morning, from inside the shop to the workroom. I then unlock the office, fire up the computer, and do the most important thing - I put the kettle on. By then the computer is good-to-go, and I double-check no orders have arrived in the half-an-hour since I last checked, and flag up all those I need to reply to during the day. Then I head into the shop, removing any flowers which have been in stock for 48 hours (this is very rare as I tend to sell-out pretty much by the end of each day; the bonus of being able to buy from my wholesalers every day). Once the flowers are removed, I set about making up the orders for the first delivery run, usually finishing just as I need to open the shop at 8.30. This is also when I remember I boiled the kettle over an hour ago, so whizz out to the kitchen, reboil it, add everything to the cup (the milk last, always the milk last) walk through to the shop, pop the cup on the side and put all the planters out the front of the shop so that people know we are open. I then head back in, make up the next round of delivery orders, before conditioning the remainder of the flowers I've had in that day, and adding them to the vases already in the shop. At this point I see my tea on the side, the teabag still in it and no steam rising from it. I pop the teabag in my little compost bag (these all go home with me and into my compost bin) and I drink down cold tea (not nice but usually by this point I am gasping). When all a day's morning orders are ready (usually around 10 - 10.30) I then sit down with my breakfast (mini shredded wheat and oat milk being my preferred choice right now). As I eat those I log onto the shops bank account (terrified at what I may not find) and pay any bills which need paying, alongside checking everything that needs to be cleared has done so. Then I add any online orders to the daily diary, checking I've remembered to attach the photo's to each order. I photograph all orders after I have made them, the photos being attached to the correct order in the diary. I do this for 2 reasons. 1) because unfortunately there are some florists out there whose scruples leave a little-to-be-desired, and I have (in the past) had another shop remove the card from a funeral tribute I made and delivered to the funeral directors before them, and place it onto the tribute they have made. Luckily I'd taken a photo of it that day before it left the shop as I was working on a new selection guide, so when my very angry and distraught customer came in to complain about the tribute with her card on, I was able to show her the one I had made; she remembered seeing it at the funeral and I was able to placate her (this (sadly) has happened on more-than-one-occasion); it has happened also with a birthday hand tied bouquet we delivered, although the card wasn't removed, but the recipient had received a few bouquets that day and had thanked my customer for the wrong bouquet, sending her a photograph of flowers which were totally different to those which I had made for her. Having a photograph really has covered my back many times. Number 2, is because I have a lot of customers who have standing orders with us, and I like to make each fortnights (or each months) flowers different to those they have had previously. Being able to check back to see what I sent means I don't repeat the same colours/flowers as before. Once I've checked all of those, I then reply to any emails which need an urgent response (as urgent as I am able). I'm usually back at my workbench by 11 to make up that afternoons orders. In between making up orders I serve customers (often stopping in the middle of making an order up to make something for them to take away with them - while-they-wait) and field phone calls (way-too-many of which are people trying to sell me stuff I have no need for, or would be interested in). The afternoon sees me making up funeral tributes for the following day. I don't like to have to make them the day before, but they'd never be able to be delivered on time the next day if I didn't. Every shop I've ever worked in has also made theirs up the previous day. On average I will make 16 hand tied bouquets, 4/5 traditional bouquets, and a dozen sprays, sheaves or posies for funerals; there is always at least 2 'specialised' tributes to be made as well (pillows, hearts, birds, angels etc). I also prep for any funerals; ie making the ribbon edging that goes around the 'specialised' tributes, soaking the foam needed for the next day, and carving/sculpting any bespoke tributes which I need to have ready. As soon as I have everything made I will then sit and reply to the rest of the emails. At some point during the day I do try to log on to our social media pages to post an update in them (often not getting anything posted for days). I begin with Instagram (because that then shares to Tumblr and Twitter directly for me) before moving onto Facebook, G+ (in-a-way I'm glad they are closing that one down). Pinterest gets uploaded if I remember (it's not as quick as the others). I also have our main google business page to keep on top of (they email me if I don't) and LinkedIn. How some shops are able to post on their social media many times each day is beyond me. During this time I also try to check facebook to see if anyone has messaged me on there (I do have an automated response on there saying to email or call the shop if it's urgent as I don't always get time to check FB). Invoices and receipts are also typed up and emailed at some point during the afternoon. At least 1 hour everyday is spent chatting with people; on very rare occasions they will make a purchase, although most are not (and I don't believe have any inclination to be) customers; they just like to 'pop in' for a chat. Having spoken to friends-in-the-trade this seems to be a common theme among florists. Maybe it's the colours, the scents, or the fact we all have friendly faces!!! but we do find ourselves treated as a local 'drop-in' centre. Friday afternoons are different to the rest-of-the week for we don't have funerals here on a Saturday; we do, however, have weddings and so Fridays are all about preparing weddings. Church, table and reception decorations will be made on a Friday afternoon, as will (occasionally) bridesmaids tied bouquets; because these can be stood in water overnight it makes no difference if they are made the day before, for the flowers unmade would be in water overnight anyway. By the time everything is done-and-dusted, it is usually time to go home, so I lock the doors and pootle off. 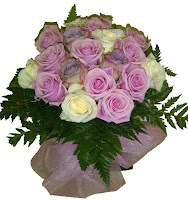 Once I've done what I need to do at home, I then sit down and order the flowers I need for the next morning, check through to see if anything has come in via the website (I re-check this about 11.30pm too as I am able to order flowers up to midnight for next day delivery from my wholesalers). Saturdays the shop is only open until 12 noon. This is when weddings will be made and completed, as well as that days (everyday) orders. 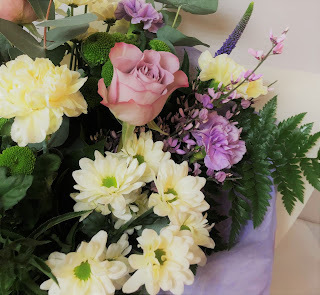 After 12 is spent with appointment customers (brides and families who are unable to get down during the week to organise funeral flowers for their loved ones). I use a Saturday afternoon to type up any quotes I have to email out. I also take all of the shops vases into the kitchen, pop a drop of bleach into them, fill them with water and leave them until Monday to ensure they are clean and any bacteria in them is killed off. Sundays are much more relaxed as I can work to my own time scale, however, I still have to come in and makeup any funeral items I have for Monday. So, there-you-have it. This is what I do all day. Oh wait; I've only shared with you a "typical" day. I've forgotten about the "not-so-usual" days. Weddings don't just happen on Saturdays any more; oh no, they happen any day of the week (I'm really not keen on early morning Monday ones, if I'm being totally honest). Then there is Valentines Day; that's not "typical" (thank goodness!) and if it falls during a weekday can create all kinds of chaos, as Valentines orders are in addition to our everyday orders and on average we make around 200 orders for Valentines day. This is also one of the very few days each year that I do refuse to book a wedding in for. Every Tuesday and Thursday I also complete a full water change for every vase in the shop. That means every single vase gets emptied (I use the water to give all the shops plants a drink so it's not wasted) bleached, scrubbed and refilled. Once-a-month I change the window display; this results in the shop having to be re-organised too as I have to find homes for everything I take out of the window. On very rare occasions I will shut the shop for an afternoon - it's so inconsiderate of doctors and dentists not to work on Sundays, however, I then come back to the shop later that evening to makeup all I've not been able to get sorted before I've left early. I would not swap my job for any other in the world - except to be a tour guide in an old house, or caves - I'd quite like to do that for a living, as long as everyone was cheerful and children behaved!!. I get to work with beautiful flowers every day. I get to let my imagination run free so often; I am challenged (mentally so very often!!) many times each week (who doesn't like a challenge?). Each day (even now after all these years) I still learn something different regarding floristry. I consider myself to be truly blessed.